Earlier this month, a Tesla Model X (assisted-driving car) drove itself to a hospital and saved the owner’s life. Some people still see these examples and think autonomous driving is in our far-off future. Yet, in reality, it’s already here. The technology isn’t perfect, but it’s improving at a blistering rate. Certainly faster than we humans will improve our driving abilities or improve safety mechanisms in cars. Not only will self-driving cars start to transform our infrastructure, they’ll fundamentally change our culture — something that translates to a big opportunity for marketers. According the American Driving Survey, Americans spend 30 to 60 minutes driving each day. Of note, higher income earners and potentially more valuable consumers fall toward the high end of that spectrum. If these individuals get back hundreds of hours a year, advertisers will no doubt attempt to make use of that new free time. 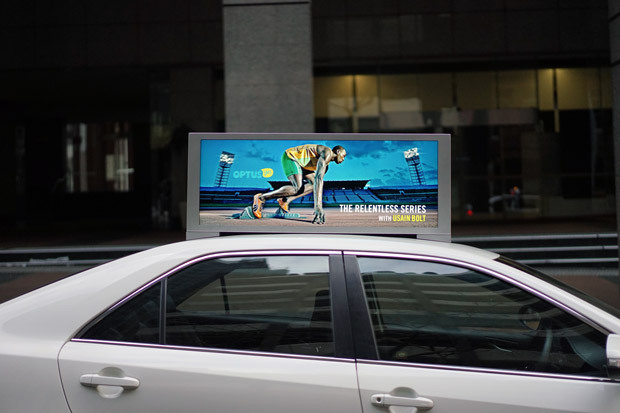 OUT OF HOME: Billboards have traditionally been an effective though constrained medium due to the lack of time drivers can look at them. This channel may be in dire straights if drivers are ignoring the road altogether. Much like the “second screen” took over as the primary screen from TV (especially during commercial breaks), consumers may tune out billboards if they can instead devote attention to their phones. No amount of digital OOH, QR codes or clever headlines will solve for the ultimate demise of billboards in this scenario. But there’s a big opportunity in this shift! Augmented reality on your windows (and phones) will become the new billboard. Car sharing services like Uber and Lyft will almost certainly unveil their own version of ad networks to supplement their income or subsidize cheaper rides. While traditional taxis relied on relatively archaic video screens and annoying audio that most people shut off, technology-focused transportation companies will look to complement, not disrupt, passenger experiences with branded overlays of real-world places and geo-filters that make the outside world seem a bit more magical. As Ben Kunz explained in his latest piece on Ad Age, apps like Pokemon Go have helped bring AR to the mainstream. We’ve had the technology to display content on car windows for some time now. Safety concerns have stopped manufacturers from blowing out this technology, but if we’re no longer in charge of driving, our car windows will undoubtedly become a new outlet for creativity, marketing and commerce. Audio will continue to evolve. Most new vehicles are already equipped with voice recognition, and the podcasting/streaming revolution has helped ensure most drivers are now connected to the web. As more riders start to treat their mobile device as their core screen, audio will likely become the secondary interface of autonomous vehicles. While you’re clearing out your inbox, you’ll also be able to ask your car to read off current prices on flights to Hong Kong, or tell you about the restaurant you’re passing, or sell you an audio tour about the beautiful coastal highway you’re traveling on. Geo-local deals will be even more important as people start to fully operate their smart devices in the car instead of hold their hands on the wheel. As an example, today when you open up the Hotel Tonight app near a hotel you’ll see discounted nightly rates for establishments you’re in close proximity to. These kinds of offers will become more and more common as both local and national brands look to woo consumers who are just a quick right-turn away. While adoption of beacons among consumers has been low inside of stores (where they’ve probably already made decisions about what they’re going to buy), self-driving cars may provide a more captive environment that passively entices people with nearby deals to be had. On days like Black Friday, you can imagine how many retailers will be trying to outbid and outshine each other while trying to steal the market of potential shoppers in the same neighborhood. Why should you start thinking about all this now? The smartphone displaced the PC as the most-used connected device. The car has a good chance of becoming a solid No. 2, given how much time we all spend in vehicles. This reality will be here sooner than you think. The biggest impediment to self-driving cars isn’t technology or adoption — it’s regulation. Assuming lawmakers begin to acknowledge that autonomous cars will save more lives than traditional vehicles, we’ll see a rapid change in how we interact with vehicular transportation.